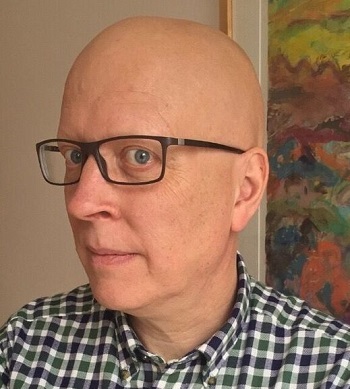 Philip Cashian was born in Manchester in 1963 and studied at Cardiff University and the Guildhall School of Music and Drama with Oliver Knussen and Simon Bainbridge. In 1990 he was the Benjamin Britten fellow at Tanglewood where he studied with Lukas Foss. He was awarded the Britten Prize in 1991, the Mendelssohn Scholarship in 1992 and the PRS Composition Prize in 1994. His music has been described as "an uncompromising reflection of the modern world” and “coursing with energy, driven along on high-octane rhythmic invention: it’s constantly diverting, constantly surprising” (The Guardian). He has collaborated and worked with many leading musicians, ensembles and orchestras including the St. Paul Chamber Orchestra, London Symphony Orchestra, the BBC National Orchestra of Wales, BBC Symphony Orchestra, Britten Sinfonia, Royal Northern Sinfonia, Riga Sinfonietta, Ensemble Profil (Romania), the Esprit Orchestra (Toronto), Birmingham Contemporary Music Group, London Sinfonietta and the Ergon Ensemble (Athens). Performances have included the Festival de Mùsica de Alicante, Aspen Music Festival, Ojai Festival (California), Musikmonat (Basle), Moscow Autumn Festival, Aldeburgh Festival, Spitalfields Festival, Huddersfield Contemporary Music Festival and the BBC Proms as well as recent performances in Germany, France, Austria, Hungary, Holland, Norway, Spain, Denmark, Sweden, Italy, Australia, New Zealand, Lithuania and China. In 2008 the London Sinfonietta commissioned him to write The Opening of the House for their inaugural concert at Kings Place and later in the same year his first opera, The Cumnor Affair was premiered by Tête à Tête Opera Company at the Riverside Studios, London. In March 2013 he was composer in residence at Oberlin Conservatoire where his Concerto for cello and strings received it's premiere. Recent commissions include Firewheel for Dark Inventions, Strix for the Britten Sinfonia Academy, the world’s turning for the Esprit Orchestra (Toronto), The Thin Night Darkens for Xufei Yang, The Language of Birds for Tabea Debus and Scenes from the Life of Viscount Medardo for Richard Watkins. In 2017 his String Quartet No.2 was premiered by the Gildas Quartet at the St Magnus International Festival and Psappha gave the premiere of Leonora Pictures in Manchester. His second piano concerto, The Book of Ingenious Devices, for Huw Watkins and the BBC Symphony Orchestra was premiered in the 2018 Aldeburgh Festival conducted by Oliver Knussen. Cashian has also written extensively for young and amateur musicians: to date he has written six pieces for the ABRSM’s Spectrum series as well as large scale works for Contemporary Music for All and the Centre for Young Musicians. Between 2010 and 2013 he was invited by the British Council to curate a series of concerts of contemporary British music in Bucharest during the course of which works by over sixty living British composers were performed. He is also a sought after teacher and has been Head of Composition at the Royal Academy of Music since 2007. Recordings of his music are available on the NMC label including the two portrait discs The House of Night and Dark Inventions.